Have you ever checked how many visitors does your blog attract or in other words how many visitors are glued to your blog ? If not, consider checking it once. The reason I say this is, you word hard in building up content and if no one is reading it completely, then it’s a waste of time & your effort. So it is very essential to check how much time do visitors spend on your blog. You can easily find out that statistic using Analytics Intelligence’s Flat Table Report or setup Custom Alerts to get that report on a daily basis in your Inbox. Another way to find out is to check your blog’s bounce rate. That will help you in finding out whether your visitors are liking your blog or not. The average bounce rate should be around 65% – 75%. A clean & elegant Design. Putting up polls in the Sidebar area. So, today I’m going to explain in detail how the above points help in keeping visitors glued to your blog and thereby reduce your bounce rate. 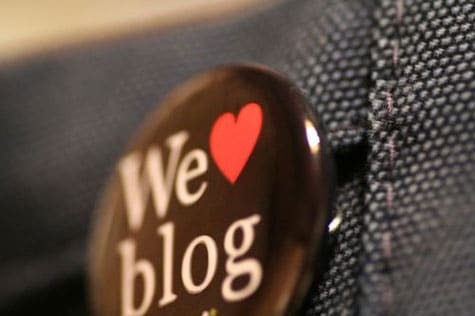 Make your Blog Visitors say that! It is often said by probloggers in their Blogging Tips posts that, Quality is superior than Quantity. I completely agree with that. But the single and most important question which arises in my mind is that, if you don’t write more then how will your visitors be able to spend more time on your blog when they’ve nothing more to read. When I say write more, it doesn’t mean that you should be including all non sense stuff. Stick to your topic and try to include examples for each and every point you include in your post. Don’t ever forget the thumb rule of Blogging i.e. to Write well and produce quality content. If you just spend time in increasing your word count instead of providing something useful to your readers, then you should expect those visitors to never come back to your blog again. A perfect example of a good blog post is the one which contains an image (which definitely speaks thousand words) and the write-up explains what the image has to say. So you see, that post has both quality in the form of the image and quantity in the form of the write-up. So you need to make a strategy to combine quality and quantity. Such a strategy will satisfy your readers as well as the search engines. Image does speak a thousand words about your content, similarly a blog design speaks thousand words about your blog. If you notice carefully, many probloggers are not good Web Designers. But they hire the best web designers in the market and get a clean and elegant web design done. But why do they have to do that, when their content is loved by millions ? The simple reason for that is, visitors see your blog’s content as well your blog’s design. If they don’t like the way your blog looks, then they’ll probably opt for an RSS Subscription rather than visiting your blog everyday. I don’t think any blogger would want their readers to just read the posts in RSS readers or from inboxes. If that happens, then it will definitely reflect in the revenue report & also in the analytic stat. If you are a budding blogger and you don’t want to invest money on a blog design, then go for some free wordpress themes which are SEO optimized & look elegant. In February I made a custom design for DailyBlogging just for the fact that I myself didn’t like the previous design. A good Blog Design will keep your Visitors glued to your blog for a long time thereby increasing the number in the “Avg. Time on Site” section of your Google Analytics Dashboard. So think about it & if necessary get a redesign done. I’ve seen many blog sidebars containing just a single Email Subscription Widget. If you are one among those, then I must tell you that you are under utilising the sidebar area to a great extent. A Sidebar of a blog is meant for showing your visitors something useful. That something useful could vary from a Popular Posts Widget to a Poll Daddy Widget. If you find that the sidebar is the area where most of your visitors click, then you should consider placing some Google AdSense ads or put a BuySellAds banner spot for sale in that particular area. Preferably go for some custom codes instead of installing WordPress Plugins for each and every widgets. Using plugins will increase the loading time of your site and that can have an effect on your search engine rankings. Interlinking can not only help in giving your older related posts a fair share of SEO juice but also make your visitors glued to your blog content. There is no limit for interlinking in your posts, but you need to make sure that it doesn’t make your readers angry or give them a reason to leave your blog. Interlink with Anchor text only when it is absolutely essential and ensure that it points to a related post. So if you are writing about SEO Tips, interlink to Decrease Load Time (as it’s a deciding factor in SEO). I would recommend using the Automatic Linking feature in Windows Live Writer (WLW) as a free option or SEO Smart Links Premium edition to make your job easier. Now, coming to the Related Posts point, I prefer using Related posts with Thumbnails. It does affect the site load as we scale down images using a PHP function, which is considered bad as per Yahoo’s Speed Up Guide. But we don’t need a blog which loads in one second but has nothing to offer. So I would recommend you to Add Related Posts with Thumbnail, preferably without using Plugins. (Refer the interlinked tutorial). If you are newbie in web development/designing then go for LinkWithin plugin or WP Thumbie. This is the trick I learnt by visiting the top notch blogs. Those blogs follow a simple procedure. First they review the product/plugin and giveaway the same premium product on another day. Basically what it does is; keeps the visitors attached to your blog. Firstly, you should write a review of a premium plugin and then end that post with a strong statement. I will Giveaway this plugin in my next Contest, So stay Tuned! That single line can fetch you lot of Subscribers in a single day & your readers might check your blog every next day looking out for the Giveaway. But remember, you need to be Smart enough to choose the product/plugin. Just check the trends & popularity during that period & select the one which makes it to the top of your searches. I know that you are not used to such long posts here at DailyBlogging and I do hope that you are not bored after reading this. Which other methods do you use to reduce the bounce rate of your blog & thereby keep visitors Glued to your blog ? These are all essential ideas that new bloggers and maybe even some novice ones should implement. I was considering having a free give-away contest on my blog but am not sure how to do it. I was thinking of something physical that I could mail to them. Bounce rate is important, but I also like to take a look at the average on time stat, I feel like that is more important than the bounce rate. To me its so hard to really judge the bounce rate, I mean its Google’s methodology behind it but to me an average time is very straight forward! We apply super glue, haha! All right, seriously, I think the best method to keep visitors and readers on our site is to provide them with good quality content! Of course, if we offer interesting stuffs such as contests and etc, it will also work! Interlinking your realted post with anchor text is great way to engage your visitors. Arranging weekly or monthly contest is too very effective to maintain your blog traffic. Very useful tips for newbie bloggers. Giveaway are the best way to keep your readers engaged. They just keep on coming back…! Some interesting points and good to see you following up on the previous post about your traffic stats. Might be interesting to see some things you shouldn’t do either. I think a lot of it also depends on the TYPES of traffic you’re getting. Are you pulling in search engine traffic for obscure terms simply because you can, are you getting tones of social media come and go? Or are you getting quality organic searches on your topic or click through’s from relevant blogs / sites.Many things go into a bounce rate; I think it’s a happy medium; I’ve gotten mine down to ~58% now but with some recent social media stuff it will probably rise again. In my case interlinking helps a lot than other things, when i started it my bounce rate has improved a lot! Good tips Mani. I agree with you about quality and quantity because it is really important that our blog is updated occasionally; if not daily at least weekly, so that visitors will always have something new to read when they come back. I agree with all the points you mentioned in this Post. I think adding the usefull widgets in Sidebar is most Effective of all and Blog design comes in Second. Other things with a blog is to respond to comments, may have dofollow, have a Top commenters list, etc. But still is Quality the most important in a blog. Hi MANI VISWANATHAN , I want my blog to be a forum for the important issues of today including healthcare,housing, social justice, right livelihood. How do I let people know this blog exists? I’m new at this and simple suggestions are best but all suggestions are welcome. Hello Mani Viswanathan,Useful and updated information attracts the user more then other things . I always focus on the same to attract my visitors in my sites. You can try yourself and you’ll surely see a positive effect on your Search Engine Rankings. Definitely Interlinking technique will help users to read more articles and timing ratio of Visitor will be high.